The Zefal HPX largely used by road bike riders, is the successor to the Zefal HP frame pump. 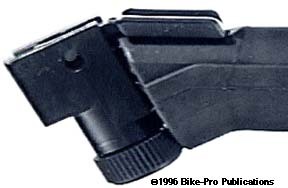 Unlike the HP model, the HPX doesn't require an "umbrella" clip mounted on the seat tube to retain it tightly on the bike frame. The HPX uses a spring mounted in the handle section of the pump's to expand the pump length so it fits tightly between the top of the frame's bottom bracket shell and below the top tube. On the HPX's air chuck are two non-marring, nylon plastic "feet" that fit against the B/B shell, and it has a concave nylon top that presses against the seat lug so your frame and its paint finish won't be damaged. The HPX's compression tube is made of aluminum alloy, with a textured Black plastic sleeve over the last five inches near the air chuck as a hand grip. The air chuck is forged aluminum alloy and has a thumblock. 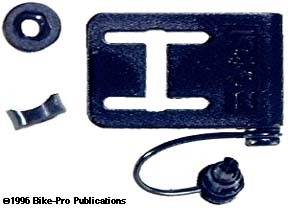 The air chuck has a removable valve face plate so inner reversing parts can be changed to accommodate both Presta or Schraeder valve inflation, though it comes from the factory set for Schraeder valves. The plunger assembly, using the handle side plastic compression tube cap, unscrews from the compression tube, and includes the spring loaded handle, plunger shaft and piston. The plunger shaft is made of rolled steel tubing. The piston uses a plastic washer and cup-shaped rubber "leather" which are crimped onto the end of the plunger shaft. The handle compressing the expansive tension spring is made of aluminum. The HPX has an unusual feature built into the handle. The nylon cap that butts against the seat lug is also a spring tension adjustor with two positions, HP or X. When the cap is turned to the "X" position, it is set for frame mounting and the spring permits the handle to compress over the pump body by 2 1/2". This is what permits the pump to adjust to different sized frames, yet hold the pump firmly in place. In the "HP" position, the spring is prevented from compressing so the pump can be used for inflation with a full throw on the pump stroke. To fit all frames correctly, the HPX is made in four numbered sizes ("1" is the smallest, "4" is the largest). The length of the compression tube and plunger shaft is sized to fit each frame size range. Consult the pump table for sizing, individual weights, and air compression capabilities. Remember the measurements will be from the center of the B/B shell to the center of the frames's top tube. We sell the HPX in Black with White lettering. The Double Shot is Zefal's frame fit double action pump. It uses a second compression tube within the primary compression tube, that compresses air with the "out" or "up" stroke of the pump. Because the secondary or inner compression tube is smaller than the larger outer one that houses it, a smaller volume of air is compressed on the "out" stroke than it does on the "in" or secondary stroke. The Double Shot uses an internal expansive spring like the Mt. Plus and Mt. Trail to hold it in place on the bike between the top of the B/B shell and the bottom of the top tube at the seat lug. The points of contact are styled to maximize the frame contact for a firm hold. The Double Shot like the Mt. Plus and the Mt. 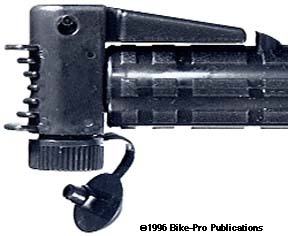 Trail comes with a pair of nylon adjustable pump pegs weighing 10 grams, so the pump can be mounted on a frame that it's not necessarily sized correctly for. The outer compression tube is made of hard plastic with a 5" long textured surface sleeve that serves as a handle and seems to also be a compression tube end cap. This outer sleeve has three small holes in its end which serve as air draw holes during the "out" stroke. The expansive spring for frame fit purposes is housed internally at the base of this handle section. The plunger assembly on the Double Shot isn't easily removable because of the inner compression tube and a set of necessary seals to make both compression tubes air tight in use. The inner compression tube also functions as the plunger shaft and is made of aluminum tubing. A second 5 1/2" long molded plastic grip is attached to the plunger shaft and air chuck is fastened at the end of this grip. 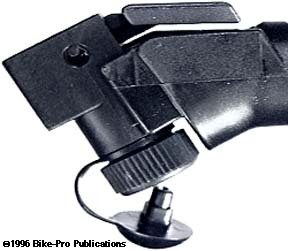 The air chuck is made of cast plastic as a separate piece, and has a thumb lock. 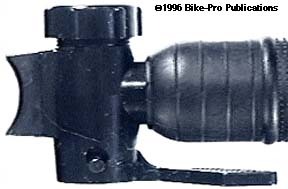 The thumb lock not only provides a tight seal around the inner tube valve stem, but when closed, also forms the final air tight seal between the air chuck and the compression tube. The steel pin which holds the thumb lock to the air chuck is also the means which holds the air chuck to the compression tube. The air chuck has a removable valve face plate so inner reversing parts can be changed to accommodate both Presta or Schraeder valve inflation, though it comes from the factory set for Schraeder valves. To fit all frames correctly, the Double Shot is made in five sizes with the length of the compression tube and plunger shaft sized to fit each frame size range. Consult the pump table for sizing, individual weights, and air compression capabilities. Remember the measurements will be from the center of the B/B shell to the center of the frames's top tube. The Double Shot comes in Black with Silver lettering. In our discussion of Zefal's HPX, Mt. Zefal Plus, and Zefal Double Shot frame pump we have spoken of frame fit mounting between the B/B shell and top tube as though it were going to be mounted on the front side of the seat tube. There are instances, like when you have braze-on bottle cage fittings on the front of your seat tube, where you don't want to mount a pump, in favor of a bottle. For these instances Zefal has a mounting plate, the Doohicki, designed to permit you to mount those three models of their pumps to the rear of the seat tube. Using the Doohicki requires that there be a hole drilled, front to back through the chainstay bridge on your frame. The chainstay bridge is the horizontal tube joining the chainstays just behind your bottom bracket shell. The Doohicki bolts to the bridge through the hole using contoured adapters, cantilevering toward the B/B shell. Two tabs are cast into the air chuck on these pumps that fit squarely and securely into the Doohicki at the bottom. At the top of the pump, a pump peg may be used. The Doohicki has a cap which fits into the valve hole of the pump, tethered on a tiny leash to prevent dirt from getting into it. The Doohicki and all it's parts are made of molded plastic and has a total weight of 9 grams. It doesn't come with the needed steel bolt to fasten it to the bridge.